IS YOUR ETHNIC JEWELRY COLLECTION COMPLETE? Whether it’s a festival or wedding season, no ethnic dress is complete without the right accessories. From a floral dress to saree to an Anarkali suit, ethnic jewelry is a must to bring the entire look into its true element. All jewelry lovers have one section for ethnic jewelry in their hoard stash. These stashes are getting even bigger since you can shop online for ethnic jewelry at marginal prices. But is your collection really complete? Do you have all the must-haves? Jhumkas an integral part of ethnic jewelry. From everyday tiny jhumkis to festive grand diamond studded ones, there is no way your collection is complete without a pair of jhumkas, or maybe 7. The best thing is that there are so many options available in patterns that you can wear a different one for every day of the week. Agreed that you can’t wear a maang tika on every kind of attire. But when festive season comes, you’ll want one. From dainty drop tikas to studded centerpieces, your wedding season special collection needs a couple of maang tikas to be complete. Keri is a pattern that is quite common in festive ethnic jewelry especially necklaces and earrings. However, you can also find it in armbands or bracelets. There’s a reason why this pattern is so popular in ethnic jewelry. It’s because the pattern is gorgeous and royal. The pattern represents Indian royalty and thus a preferred design in precious and semi-precious metal jewelry. Polki is a kind of raw diamond that is used in jewelry without processing. It is thus not too shiny and while many confuse it with kundan the two are different. A Mughal gift to Easter Culture, polki jewelry is seen as royal jewelry and usually worn in weddings. Lighter Polki jewelry is also worn in festivities. Another quite popular ethnic jewelry is beaded hoop earrings. Usually featuring tiny junki domes hanging to the hoop, these earrings are perfect for your everyday ethnic dresses. Bo’Bell’s Traditional Bolly Polki Earring is a perfect example of beaded hoop earrings. While bracelets and cuffs are more of western jewelry, ethnic jewelry has the counterpart, bangles. An ethnic attire usually includes glass, metal or “lakh” bangles of multiple colors. 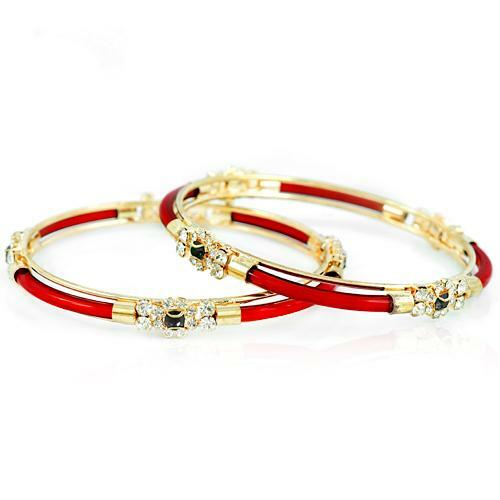 Bo’bell’s Elegant Attractive Traditional Bangle Set has been designed giving a modern touch to the traditional bangles. Just like Polki, kundan is also a Mughal gift. The difference between the two is that while Polki is a diamond, Kundan is glass placed in the frame of metal. Hence Kundan is comparatively cheaper. But that, in no way means kundan looks any less royal than polki. Meenakari is a kind of art that uses colors over metals to create beautiful pieces of decoration, utensils and jewelry. This Persian art should be a part of every ethnic jewelry collection. 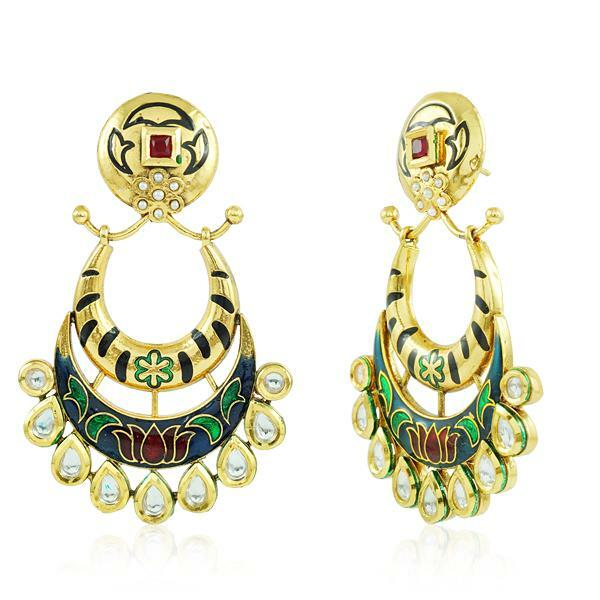 Bo’Bell’s Graceful Meenakari Designer Danglers are a true representation of this art. At Bo’Bell Jewels, we strive to create a one stop shop where you can find every kind of ethnic jewelry to give you a wholesome ethnic jewelry online shopping experience. Above was a list of our must haves for any ethnic jewelry collection. Tell us in the comment section if we’ve missed out on anything. Previous PostPrevious 5 FASHION JEWELRY PIECES YOU NEED TO OWN, LIKE YESTERDAY!